Get up to speed on the Singapore summit: How'd we get here and what do we know? Relations between the U.S. and North Korea grew increasingly hostile over the past year, but have since smoothed over — leading to this summit. 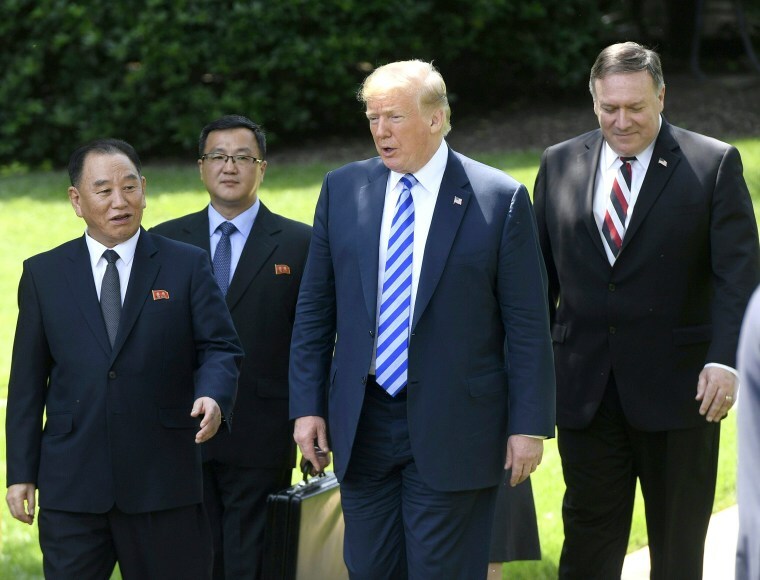 Tensions between the United States and North Korea grew increasingly ominous last summer, when President Donald Trump warned of "fire and fury" directed toward the regime of Kim Jong Un. Trump's bravado came hours after reports that North Korea had developed a nuclear weapon small enough to fit on a missile. In the days that followed, the escalating crisis cast a shadow of uncertainty — on the Korean Peninsula and the rest of the world. But fast forward 10 months, and the shaky state of affairs has flipped: Trump and Kim are expected to attend a historic summit Tuesday in Singapore in the first meeting between a sitting U.S. president and a North Korean leader. It's a face-to-face that few might have thought possible after the insults traded, but one that observers say could signal the start of meaningful denuclearization on the peninsula, normalized relations between the two countries and the two Koreas, or even a step toward lasting peace and security. How did the U.S. and North Korea get to this point? Nearly a month after Trump took office in January 2017, North Korea flashed its first show of defiance toward the new U.S. administration by launching a solid-fueled ballistic missile from a submarine. It led to further tests and, eventually, to the U.S. responding by sending an aircraft carrier to the region and the U.N. Security Council approving tougher sanctions against the North because of its weapons program. Last year was also marked by events that hampered already strained relations: American college student Otto Warmbier, who was imprisoned in North Korea for 17 months, died after his unexpected release, and Trump, during an address of the U.N. General Assembly, belittled Kim as a "rocket man." But while the two countries appeared to be on the brink of a nuclear showdown, a shift occurred in February with the Winter Olympics in South Korea, when North and South marched together under a unified flag. The two countries, which have technically been at war since 1953, later agreed to restart a dialogue. Then, in March, came a surprise announcement: The United States and North Korea said Trump and Kim would meet this spring — inspiring both hope and trepidation in the region. The U.S. and the North have no formal diplomatic channels. Never before have heads of state from each country held talks, although former president Jimmy Carter met with North Korea's founder, Kim Il Sung, and former president Bill Clinton met with Kim Jong Il, the son of Kim Il Sung and father of Kim Jong Un, after they had respectively left the White House. The historic prospect of a Trump-Kim meeting followed South Korea's national security adviser visiting Washington in March, and seemed cemented after Trump tweeted in April that then-CIA Director Mike Pompeo made a clandestine visit to the secretive nation. But two weeks ago, the budding detente was nearly scrapped when Trump sent a letter to Kim looking to cancel the summit following inflammatory rhetoric on both sides. In another twist, the summit was then officially back on after Kim sent his top deputy to personally meet with Trump at the White House. With so much uncertainty, a senior administration official told NBC News last month that getting to the point of a summit was exhausting. "This has been like herding cats," the official said. What details are known about the summit? The delegations will meet at the Capella Hotel on Singapore's Sentosa Island, the same high-end resort where logistics for the summit were ironed out. The first meeting is expected to start at 9 a.m. local time Tuesday (9 p.m. ET Monday). Among those expected on the U.S. side are Trump and Pompeo, now the secretary of state, as well as Chief of Staff John Kelly and National Security Adviser John Bolton. Former NBA star Dennis Rodman, who considers both Trump and Kim his friends, tweeted that he will also go to Singapore to show his support. It's unclear who will join Kim. Trump said Thursday, during a meeting with Japanese Prime Minister Shinzo Abe, that he doesn't need to study up before the big day. "I think I'm very well prepared. I don't think I have to prepare very much," Trump told reporters. Kim, on the other hand, will be "well prepared," Victor Cha, a senior adviser and the Korea chair for the Center for Strategic and International Studies, told MSNBC. "He’s going to have all the trap doors laid out for the president to slip into," he added. Many of the details, including the overall schedule and specifics on the agenda aren't clear, and some observers wonder if the meeting will serve as anything more than a meet-and-greet and photo-op for Trump and Kim. But denucleariziation is a key issue, and defining how North Korea will dismantle its nuclear weapons program and agreeing on the sequence and timeline could be where talks stall. Tony Namkung, an expert in U.S.-Asia relations who has served as a liaison between North Korea and the U.S., said the entire summit will "turn on these critical issues." This summit could be the first of many, he added, although another question remains about the speed of an agreement coming together and implementation. "Are we talking about a generation or are we talking about two years?" Namkung asked.